The Sequoia Conference Center features a large, 90′ x 60′ main hall that can be split into two separate, fully functional meeting spaces, as well as several rooms in the complex that can serve as “breakout rooms” for large conferences, and a fully equipped industrial kitchen. The layouts on this page represent some of the possible configurations for the spaces. Depending on your event and needs, exact setups and capacities will vary. Please schedule a consultation for further info. Sequoia A is 30′ × 60′ and accommodates up to 125* at tables. It includes a 6’x9′ video wall and three additional video screens. Sequoia B is 60′ × 60′ and accommodates up to 275 at tables. Includes a hardwood dance floor, a 13’x20′ video wall, and four additional video screens. 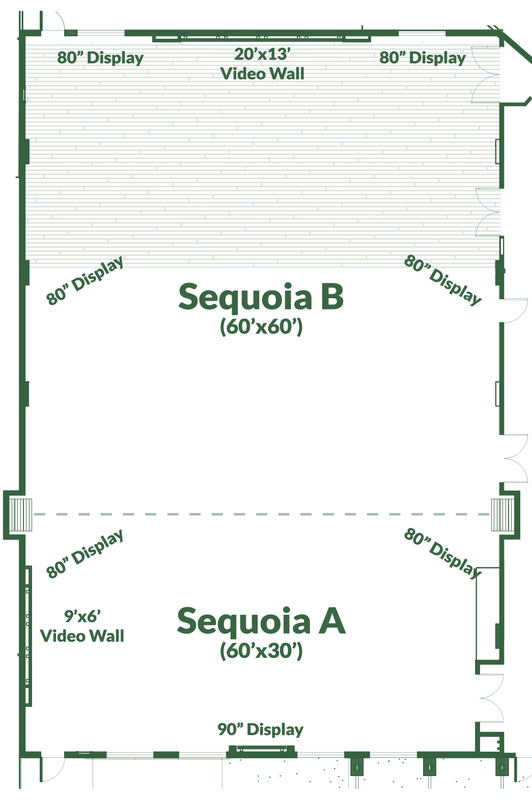 Sequoia A and Sequoia B can be combined to create a single 90′ × 60′ event space that can seat up to 448 people. This configuration also allows complete control over both large video boards and all seven monitors, and features a springy hardwood dance floor. Our sparkling new kitchen more than capable of serving up to 500 guests. We can also partner with local caterers to cater your event.